« Schumer is having a bad week. It’s gonna get worse! According to a TED Talk, pedophilia is not a choice, but simply a sexual orientation. The World is headed for Hell! Founder of the Grassroots Conservative Association Group (GRCAG) and Retired USMC Colonel Corey and Ana Duncan joins Joe to discuss issues from the inner city problems to why Democrats keep screwing the Black community. We have a lot of people who are cheerleaders and activists, but we need educators to teach our young people why the U.S. is so exceptional and how to maintain our Constitutional freedoms. People need to be educated before they can make educated decisions. Professors have made socialism and Communism trendy. If you’re in the U.S.A. and want to be a Communist, you’re in the wrong place! When we teach U.S. patriotism, they’ll understand why it’s all a lie. How do we attract young people to the conservative grassroots movement? Wear your Trump and patriotic gear and be ready to engage curious young people who express an interest. 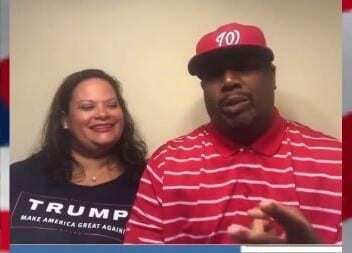 A black man and a Latina woman with a Trump shirt walk into a Cracker Barrel… what happens next? We believe in God, Family, and Country first. Reach one, teach one. That’s how we share the love of this country and conservative values.